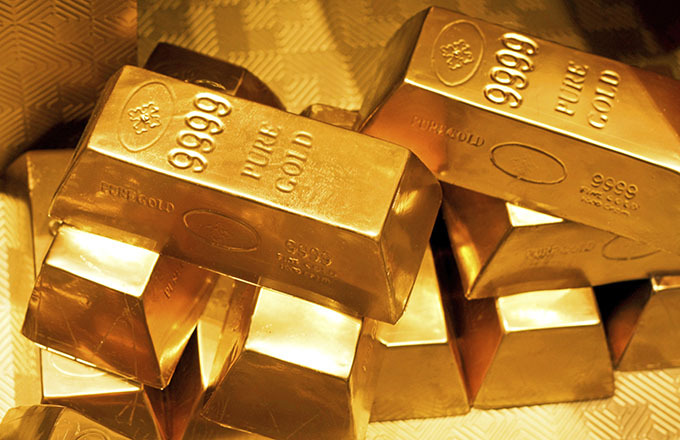 Gold prices finished modestly lower on Monday, giving back the gains seen in the previous session as investors await U.S. consumer-price index data due Tuesday for the latest clue on the pace of Federal Reserve interest-rate hikes. Global risk-on sentiment, including some gains in the U.S. stock market in early Monday trading, seen after Friday’s U.S. jobs report contributed to losses for the yellow metal. As gold prices settled, however, benchmark U.S. stock indexes saw more mixed trading and the dollar weakened, helping gold come off the day’s worst levels. April gold GCJ8, -0.01% fell $3.20, or 0.2%, to settle at $1,320.80 an ounce after trading as low as $1,315.30. Gold prices ended nearly 0.2% higher Friday, turning the metal’s weekly return just positive after a report revealed a strong rise in U.S. hiring but disappointing growth in wages. Markets had braced for a stronger wages reading after an inflation scare within this report a month earlier helped to sink stocks. Rising inflation could add pressure on the Fed to speed up its rate rises, which could strangle the stock market. Gold, in turn, although negatively affected by higher interest rates, could attract hedging demand against too-hot inflation. On Monday, the ICE U.S. Dollar Index DXY, -0.24% was down 0.2% at 89.92, but posted a gain for last week. Gold and the dollar typically move inversely as currency levels influence demand among gold buyers using another currency. Higher interest rates tend to be dollar-positive. As for other metals, May silver SIK8, -0.26% fell 7.2 cents, or 0.4%, to $16.536 an ounce. On Friday, it logged a 0.9% weekly gain. Among exchange-traded funds, the silver-focused exchange-traded iShares Silver Trust SLV, -0.13% fell 0.4%, while the SPDR Gold Shares GLD, -0.02% fell 0.2%. The VanEck Vectors Gold Miners ETF GDX, +0.83% however, added 0.2%. May copper HGK8, -0.41% fell 0.4% at $3.124 a pound. April platinum PLJ8, +0.10%fell 0.1% to $962.90 an ounce and June palladium PAM8, -1.40% shed 2% to $967.65 an ounce.